(SPOILERS) There are a fair few Oliver Stone movies I haven’t much cared for (Natural Born Killers, U-Turn, Alexander for starters), and only W., post millennium, stands out as even trying something, if in a largely inconspicuous and irrelevant way, but I don’t think I’ve been as bored by one as I have by Snowden. Say what you like about Citizenfour – a largely superficial puff piece heralded as a vanguard of investigative journalism that somehow managed to yield a Best Documentary Feature Oscar for its lack of pains – but it stuck to the point, and didn’t waste the viewer’s time. Stone’s movie is so vapid and cliché-ridden in its portrayal of Edward Snowden, you might almost conclude the director was purposefully fictionalising his subject in order to preserve his status as a conspiracy nut (read: everything about Snowden is a fiction). With his recent track record, one might almost come to the conclusion JFK was an aberration, that while it set the tone for Stone as an anti-establishment darling, his actual mind-set is much more pedestrian and mainstream. You only have to glance at some of the big subjects he has tackled since, without even a hint of delving into the greater murk that may or may not be behind or surrounding them – Nixon, 9/11, George W’s reign, the financial crisis, and now our Ed – and it’s evident that he’s approached them from the most palatable, digestible, non-boat-rocking angle. When Stone was angry he was an interesting guy, but that began to dissipate somewhere around the time of the trying-too-hard-to-outrage NBK, along with his eye and ear for provocative material. He even made a Secret History of the United States that failed to mention advance knowledge of Pearl Harbour. Snowden’s so antiseptic, so diluted, so brimming with movie make-believe, I might offer Stone the charitable get-out that he was shining a light on how questionable certain aspects of Snowden’s story are without ever actually saying as much. If it weren’t for his aforementioned recent track record. Perhaps Oliver has been replaced by a clone, and Dave was an eerie harbinger of his own creative demise? Certainly, there’s a school of thought that Snowden is, was and always will be CIA (this theory often also tends to extend to Julian Assange), the most damning mark being that pretty much every conspiracy theory going has gone untouched by his revelations, and more pertinently still, that his much-vaunted info dump has revealed precisely nothing we didn’t already know, apart from a smattering of additional jargon and trumpeted programmes to sell the story. That Snowden apparently thought he could trust instruments of the corporate mass media (The Guardian, The New York Times), goes to cast further doubt on this (just look at how shat up The Guardian was when a wildcard like Jeremy Corbyn became a real prospect, doing everything they possibly could to malign him). No, I don’t profess to know, but my resounding reaction to the Snowden “revelations” has been “And…?” On that level, Snowden is probably the movie Ed deserves, failing to display any semblance of a dramatic spine or competence. You’d have thought, if Stone really wanted to garland the “truth” the man had unveiled, he’d have honoured that “facts” of the story as much as possible, Instead, the only remarkably accurate thing in the movie is Joseph Gordon-Levitt’s performance, particularly vocally, sporting as he does an entirely unwarranted eeriness. There’s nothing in Stone’s approach that could be deemed a success – think Thandie Newton’s misjudged performance in W. extended to an entire picture – from the formlessly traditional score, to Antony Dod Mantle’s brainlessly fizzy cinematography (it’s sparky and forgettably self-conscious, adding to the sense none of this is real, and the visualisation of surveillance belongs in about 1995), to the terribly linear, trad-biopic screenplay from Stone and Kieran Fitzgerald. Attempts to punch up the structure by cutting between recreations of the material Laura Poitras shot (accompanied by a series of unconvincing performances from the likes of Melissa Leo, Zachary Quinto and Joely Richardson – nice to see Nicholas Rowe, though) fail entirely. Stone possibly saw himself in the disillusionment of his main character, as previously charted with Charlie Sheen in Platoon and Wall Street and Tom Cruise in Born on the Fourth of July, but his dedication to giving us a rounder view of Ed, to investing us in the relationship between Snowden and girlfriend Lindsay (Shailene Woodley), is laughable. That kind of thing just isn’t his forte, and whenever we cut back to them the picture becomes an endurance test. However, the most screen time is reserved for the entirely fictional – and ludicrous – relationship between Snowden and CIA Deputy Director Corbin O’Brien (Rhys Ifans doing an at least entertaining Sam Elliot-gone-sinister impression), the former led by the hand down an entirely unstimulating rabbit hole, chaperoned and given special treatment: the one-on-one of mentor and pupil. It’s a very silly notion and comes across as such. The crudity of the beats is writ large. With Corbin looming over little Ed on a vast screen, just to show he’s always watching, everywhere. At least, during such moments, the picture has the virtue of cartoonishness. Not a very good cartoon, but it’s mildly diverting. During all this, Snowden’s naivety underlines how easy it would be to conclude this entire affair is a fiction of whistleblowing. He sits there, permanently winded by revelations of drone strikes and mass surveillance. There are repetitive and poorly-devised question-and-answer sessions, as he incrementally learns the lie of the land and so feeds his doubts. 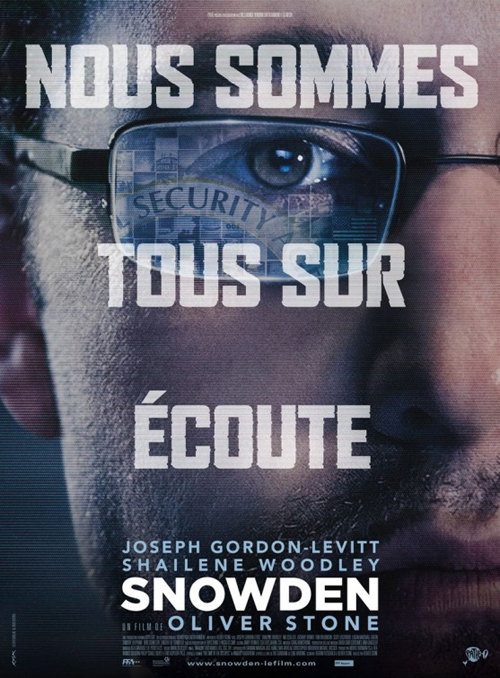 These only ever come across as stagey and unconvincing – maybe (the real) Snowden was actually written by Hollywood? Perhaps the biggest farce of the picture is how Ed is made out to have been a really important guy to the workings and dubious achievements of the NSA (Epic Shelter – “I built it”) and something of a genius to boot. Still, it does foreground that you really ought to wonder at someone who would resign from the CIA on ethical grounds, so crossing over to the NSA and then go back to the CIA again. Then again, he could be bona fide. Just surely not as lethargically as Stone manages to present. Various familiar faces show up – Tom Wilkinson, Tom Hardy Logan Marshall-Green, Timothy Olyphant and Nicholas Cage – to little consequence. It’s one of those pictures where the luminaries have turned up to support an idea, no matter how shoddily it is expressed, and even if doing so plays into the hands of those it purports to critique. Stone finishes with footage of the real Snowden. Of course, he does. The banality of this device is irksome in the extreme. It’s the laziest, and seeming most obligatory, option of the modern biopic. Have the courage of your dramatisation without showing you actually don’t by propping it up with the real deal. Stone’s dumb and dull movie is perhaps best summed up by Peter Gabriel’s specially composed ditty over the end credits: “There’s no safe place to go, now you’ve let that whistle blow”. Nice literalness there, Pete. 25 years earlier, Oliver Stone delivered a masterpiece of provocative, establishment-pricking filmmaking that managed to evoke (All the President’s Men) as much as it did influence (it’s one of the most extraordinarily-edited movies ever). Snowden isn’t even a bad film with fire in its belly. All the ayahuasca must have burnt out Stone’s creative fire.